Be the first to share your favorite memory, photo or story of James Lendell. This memorial page is dedicated for family, friends and future generations to celebrate the life of their loved one. James Lendell Dudley, 89 year old resident of the Williams Crossroads area near Mount Olive, passed away Friday evening, January 18. Funeral services will be held Monday, January 21, at 2 p.m. at Tyndall Funeral Home. The family will receive friends during the hour before the service. Flowers are welcome, or memorial gifts may be made to Rones Chapel United Methodist Church, 138 Garners Chapel Road, Mount Olive. 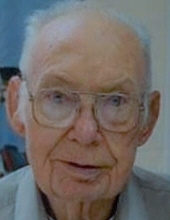 Mr. Dudley was a long time member of Rones Chapel Church where he had been financial secretary and had served on the administrative council for numerous years. He had been executive director of a public housing authority and had been a farmer. Surviving him are his wife of 67 years, Irma Byrd Dudley; three daughters and "sons," Dianne D. and Jimmy Williams of Faison, Janet D. and Cary Turner, and Rhonda D. and Ray Myers, all of Mount Olive; a brother, Wilbert Dudley, and a sister, Ruby D. Matthis, both of Clinton; grandchildren, Tracy T. Cruse, Michelle W. Bradshaw, Jennifer T. Merrill, Joshua Williams, and Kandise M. Overman; eight great grandchildren; and several special nieces and nephews. He was preceded in death by a son, Craven J. Dudley; and parents, Alda and Lucille Clifton Dudley. Remembered as being such a kind-hearted and generous man with enduring Christian values, he now walks tall with Jesus, as his church sign proclaims. To send flowers or a remembrance gift to the family of James Lendell Dudley, please visit our Tribute Store. "Email Address" would like to share the life celebration of James Lendell Dudley. Click on the "link" to go to share a favorite memory or leave a condolence message for the family.